This past January, I turned over a new leaf as part of my New Year's resolution and began eating healthier. As of my last weigh in a couple of months ago, I lost 86 pounds by doing this and feel like a new person. It's no secret that I love food. I was born into a Polish-German family that eats heavy, starchy, rich foods and uses food both to celebrate and to comfort. Even though I've changed my eating habits, I still enjoy having snacks as a daily part of my routine. This is one of those recipes that's great to snack on; occasionally, when I'm not majorly hungry and/or don't feel like cooking after a long day at work, I will sometimes eat this for dinner - no kidding. Put popcorn in a large bowl; add the rest of the ingredients. Mix and eat. Yummy! By the way, the calorie count for this recipe is just under 300 calories. Not bad for a satisfying - yet healthy - snack. Enjoy! TWO ATC SWAPS - Retro Housewife and Christmas Music - Sign Up Here! CHRISTMAS MUSIC: Capture the words of a Christmas song in your creations, for example, "Walking in a Winter Wonderland", "Jingle all the Way", etc. This is a 3 for 3 swap. Card designs may be the same or different and sized 2.5" by 3.5". 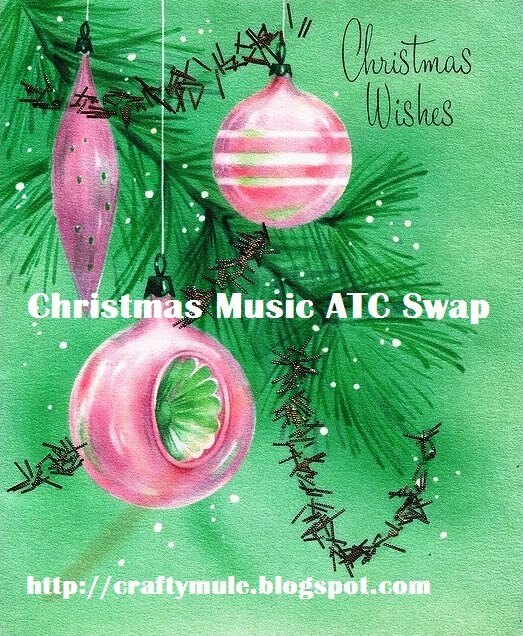 6) Invite your friends to participate and please feel free to use the swap badge(s) above to help promote the swaps. The more, the merrier! YOU CAN SIGN UP FOR ONE OR BOTH SWAPS. JUST LET ME KNOW WHEN YOU RESPOND WHICH ONES YOU'D LIKE TO PARTICIPATE IN. THANKS. 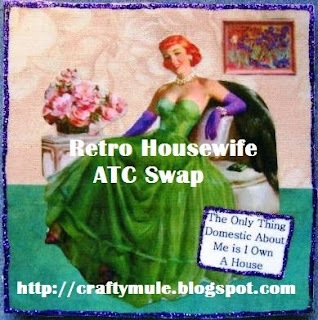 If you'd like, please post your creations to the Two Crafty Mules altered art swap gallery page. I am on vacation for 2 weeks which gives me lots of time to work on projects I've been wanting to try. I've been hoarding felting supplies in my craft studio for quite some time now. I decided to give wet felting a try today and put some of those supplies to good use. Laying out the wool roving. Giving it a good scrub on my handy dandy washboard. The finished piece laying out to dry. The finished piece isn't perfect. Notice those little holes in the finished product? Next time I will have to lay out the roving a little thicker. I will probably cut this up and use it to embellish an art quilt or brooch after it dries. Last week, my place of employment sent me to Little Rock for a business meeting. Being the crafty gal/shopaholic that I am, I always love to check out new places to shop when visiting other towns in my free time. And, boy, did I find a good one when I stumbled onto the Argenta Bead Company in North Little Rock, Arkansas. I felt like a kid in a candy store during my visit. One of the walls filled with Czech glass beads. Czech glass buttons "on a stick". This store has 3 rooms filled with all sorts of goodies. The main room is filled with all types of beads imaginable - Czech crystals, seed beads, pearls, gemstones, lampwork and even vintage German glass beads. There were 2 part lampwork beads that looked like little Chihuahuas, decorated cupcakes, monkey heads and the like. Half the fun was deciding which ones I absolutely had to take home with me. On shelves right across from the lampwork beads, gorgeous Czech glass buttons threaded on long eye pins and displayed in glass jars reminded me of rock candy sticks you see in any old fashioned candy store. In the same area, an assortment of metal filigree stampings and soldering supplies can be found. A close-up of some of the lampwork Chihuahua beads. The back room contains an entire wall of tools, many which you can usually purchase online or through a jewelry supply catalog. Some of the more unique items I found in this little treasure trove included a wire whacking board (just perfect for my wire jewelry making projects), liver of sulfur for antiquing silver, bronze, copper and gold, a rainbow of colored wire reels, silk ribbon, colored hemp and leather cording (to name just a few.) Another wall contained hundreds of little drawers filled with all sorts of connectors, clasps and bead caps. Pendant bezels in all shapes and sizes. My favorite part of the store! My absolute favorite room, though, was the room located to the left of the bead room. This room holds bowls filled with big metal connectors of every shape and size. I especially love the large pewter daisy connectors. I purchased several to use in my jewelry designs, but I can also picture these being used in a belt to wear over a big shirt. Unique charms and pendants such as enameled Our Lady of Guadalupe pieces, carved ivory Geisha girl heads, gold and silver skeleton keys, Washi paper, glass tiles, dominoes, Ice resin and an assortment of goodies for the mixed-media jewelry artist can be found in this room. This room also houses a small library of beading books and a classroom. Last, but certainly not least, it also contains all sorts of bezel tray pendants in many shapes and large sizes. I usually have to purchase these online and was thrilled to be able to select my assortment in person. The ladies who work in the store are also very personable and willing to assist, if needed. If you are ever in the Little Rock area, this is a fun place to shop and well worth the trip. Even if you can't make it there right away, you can check out Argenta's website for information. 1/2 Price Classes Sign-Up at JoAnn's - One Day ONLY! Having moved to NW Arkansas 5 years ago from Arizona, I went through terrible withdrawal symptoms of not having a JoAnn Fabric and Craft Store in this area. I seriously would take road trips to bordering states (Oklahoma and Missouri) to stock up on craft and fabric goodies on a regular basis. I wrote letters to JoAnn's real estate department requesting they open a store in my area. Well, guess what? It FINALLY happened! Our new JoAnn's opened on 8/27/10 and I'm thrilled to tell you I am teaching a myriad of classes there from now through December. 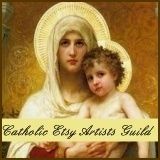 I am also teaching an assortment of beginning jewelry making and polymer clay classes. Some of the Friday night classes I am teaching will be "Girl's Night" classes. What a great opportunity to bond with your friends or family members while having fun, socializing with other crafty people and learning something new! To make all of this even better, JoAnn's is offering a ONE DAY SALE on class sign ups on 09/11/10. You can sign up for ALL of the classes you wish to take at 50% off of the normal cost! That's like a 2 for 1 deal! WOW!!! Be stop by the store to sign up for all of the classes your heart desires. The store is located in the Spring Creek Centre, 3835 North Mall Ave., Fayetteville, Arkansas, telephone (479)527-3944.